Dr. Glenn DeBias is internationally recognized for developing the 1st fractional CO2 laser skin resurfacing treatment (Active FXTM) and has performed over 21,000 of these CO2 laser procedures; he is considered one of the most experienced providers in the country performing fractional CO2. 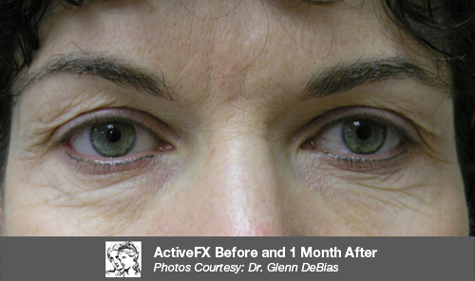 View some of The Institute’s patients Active FXTM Before and After Photos to see the improvement these treatments can have on your appearance. Results will continue to show improvement for up to six months after the procedure. If skin is properly taken care of this can last for several years. Individual results may vary depending on a number of factors. The epidermis (outer layer of skin) sloughs off and the new epidermis is smoother, tighter, and more even in skin tone. The dermis (deeper layer of skin) produces more collagen leading to thicker, stronger, and firmer skin support. With fractional laser treatment, only a fraction of the skin’s surface is treated by the laser, leaving small “bridges” of untouched skin. This technique makes the healing process much faster and enables you to get back to normal activities sooner. The Active FXTM treatment typically lasts less than 10 minutes. However, an hour should be allotted to permit time for pre-treatment pictures, anesthetic cream application, and review of post-procedure instructions. Read feedback from actual patients of The Institute for Laser and Aesthetic Medicine. Active FXTM considered the gold standard CO2 laser procedure for face and neck skin tightening and laser skin resurfacing. 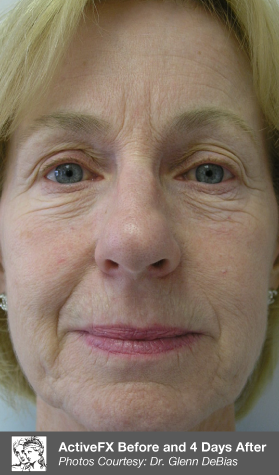 It is a 7-10-minute procedure performed by Dr. DeBias utilizing a topical anesthetic and air cooling device. It is well tolerated with 3 and a ½ days of transformation and recovery. The most dramatic results involve the 3 T’s – Texture, Tone, and Tightness of the facial and neck skin. The CO2 laser has a 25-year track record of delivering dramatic results and refreshment. Active FXTM offers a safe and natural result helping people look the best they can for their age. Set up a free consultation at The Institute for Laser and Aesthetic Medicine and Dr. DeBias will work with you to determine the best approach to attain the optimal results you are trying to achieve. One visit and you will be on your way to a more refreshed look!